This is fabulous, Laura!! Congratulations on the publication!!! And I can’t wait to see more! Hurray, Laura!! Beautiful painting and great recognition….and thanks for introducing me to an interesting zine! i had asked in a lower post if you were available for hire? i am looking for a cover artist for my book of poems, The Pirate Queen. Awesome, Laura! I’m thrilled for you–this one was my favorite, so they chose well. Love your water theme. 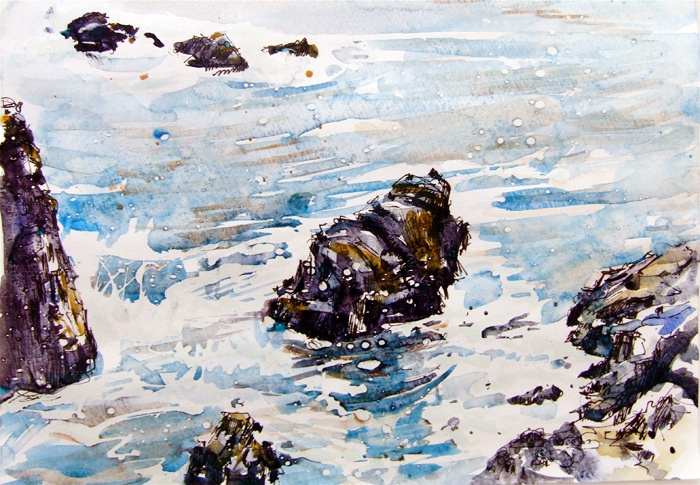 lovely painting – so much movement in the water! Wonderful. Fresh and vital. Just enough stated, but not too much. I am green with envy! How nice to see you here. Your water paintings – many – fit right in with this theme; and most visual works are photographs. It’s refreshing to see a painting – and this is, of course, wonderful. Three cheers! Well done and well deserved. I’m glad that the sublime, subliminal mind of Dave yoked us together again! this is one of your best. Awash with light and Japaneseque. This is so gorgeous – one of my absolute favorites.